MySleepyFerret » Mattresses » Which Is Better: Firm or Soft Mattress? How you can choose the right one. It can be difficult picking the right mattress. So let’s break it down and dive deeper. 2 What Makes A Suitable Mattress? 3 What Is The Ideal Firmness? 4 How Should I Choose The Right Firmness For Me? There have always been heat for the debate between firm mattresses and soft mattresses. On one hand, firm sounds like the better choice because “it’s more supportive”. On the other, why can’t soft mattresses do the same as you sleep on a mattress that can be best described as a cloud? Contrary to beliefs, there are good and bad to both ends of the firmness spectrum. There are a variety of mattress options on the market. It can get overwhelming and confusing real fast when you take a closer look at each one. Mattresses are also one of the bigger decisions, arguably the most important one, you can make. Sleeping on a mattress that isn’t right for you can mean nights of stress and days of grumpy sleepiness. What Makes A Suitable Mattress? Personal preference is a large part to selecting the right mattress. If you don’t enjoy or feel comfortable sleeping in your bed, then it’s hard to argue about other points. However, there are good and decent mattresses, then there are absolutely bad ones. When we look at mattresses, it’s important that your spine is well supported. A good mattress will ensure your spine is kept in a neutral position. This means its natural curves are well supported without any strenuous, awkward angles or positions. What Is The Ideal Firmness? This is a tough question to answer. Trying to decide on the right firmness for your mattress can be difficult because of how much other factors can influence it. All these factors can change the sleeping surface of your bed. What this means is that there is no way to tell how firm a mattress you need because everyone is different and every circumstance can influence how the mattress might feel. Depending on the mattress material, its firmness can also be vastly different. Different materials will respond differently under pressure. For example, when you sleep on an innerspring bed, its bounciness despite being considered firm, can feel very different from a memory foam bed, with its “hugging effect” (complete opposite of bounciness). So where does that leave us? What we can talk about is what the general consensus is and the more popular choice that people make. The general consensus among sleep experts and mattress experts is this: On a scale of 1 to 10, where 1 is very soft and 10 is very firm, the firmness range that can best support your spine in most sleeping positions is somewhere subjectively between 6 and 8. The more popular choice for a mattress tends to be medium-firm and firm. What about each mattress firmness? What can they do for you? 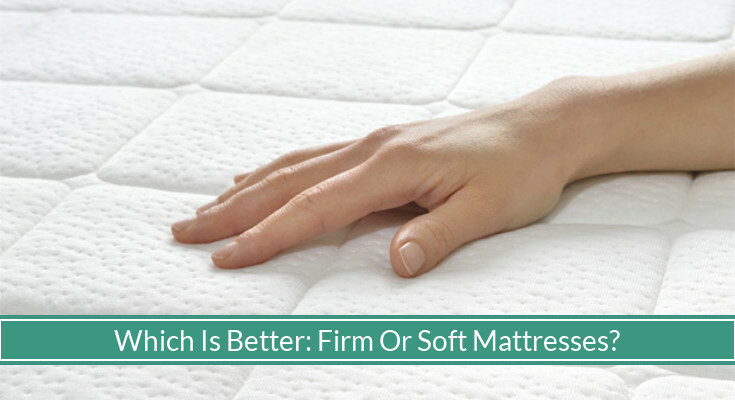 Let’s dive into a closer look at what the pros and cons are for firm and soft mattresses. A firm mattress can offer one of the best support for good posture. Most people prefer firm mattresses, and for good reason. If you find yourself with back pain or neck pain, it can help take all the work out of your back by providing the support it needs to relax. Those who struggle with shoulder pain or neck pain can also benefit from a mattress that maintains its shape well. Having a firm mattress means your muscles doing less work at night at keeping itself well positioned. Much of the pressure of your bodyweight with a firm mattress is directed at the bones, which can withstand it. Despite the good that can come at relieving the work your muscles might be doing at night, firm sleeping surfaces can hurt and be very uncomfortable. Whether you are light or heavy weight, most people can agree that sleeping on hardwood floor is unbearable. For a firm mattress to feel in a similar manner might not make for a good night’s sleep. We also find that firm mattresses can also exacerbate certain health conditions. Arthritis and scoliosis can suddenly become much worse because of how much pressure a firm sleeping surface can put on your body. It’s important to recognize that just because a medium-firm or firm mattress is popular and generally accepted as “the better” firmness, doesn’t necessarily make it a great idea for every person. That’s why it’s important for us at My Sleepy Ferret to write these guides and do our best to educate our readers! Compression is important. It’s only when the body can sink just enough that the surface of your bed can provide more contact, thus more support for your body. The more surface contact between your body and your mattress, the more buoyant support your body receives and the more your bodyweight pressure can be evenly distributed throughout the bed. This can make for a great sleeping surface for light sleepers who cannot compress firm mattresses enough or aging individuals in need of more pressure relief. A soft mattress can provide just as much (contouring) support for the body and its natural curves as a firm mattress. Soft mattresses may also sag sooner than firm mattresses with less built-in support and density. This means the mattress can be compressed in certain areas, causing lingering body impressions and premature sagging. The biggest drawback to a soft mattress is the potential lack of support for maintaining your spine. The curving of the spine can also put unnecessary stress on all common pain points of the body, including the back, shoulders, and neck. For the back to collapse and curve, this can cause awkward sleeping positions which can lead to morning aches and pain. Sleeps may also find soft mattresses let the body sink too far into the mattress, creating an uncomfortable “trapped” feeling to get off from. Tossing and turning, a natural behavior during sleep for the body to adjust itself, can also be made difficult and disrupt sleep. How Should I Choose The Right Firmness For Me? There are three main points you can consider when picking the right mattress firmness: 1) your bodyweight class, 2) your preferred sleeping position, and 3) whether you have back pain or not. If you are a heavy sleeper (above 200 pounds), you may want to opt for a firmer mattress. The pressure from your bodyweight require a mattress that can support your spine well without giving too much. If you are a light sleeper, softer mattresses can be a great choice if you find typical mattresses to be too firm. Side sleepers tend to have the most pressure placed on their body, particularly the arms, shoulders, and hips. They may opt for a softer mattress to allow more give and sink, thus more pressure relief on those pressure points. Those who sleep on their back or sleep on their stomachs will need a firmer mattress to maintain their spine alignment. If you struggle with back pain while sleeping, you may opt for a firmer mattress. Sleepers with health conditions that are sensitive to pressure such as arthritis and scoliosis should be mindful of choosing a softer mattress. If you need more help deciding which mattress is right for you, be sure to check out our guide on picking the right mattress.